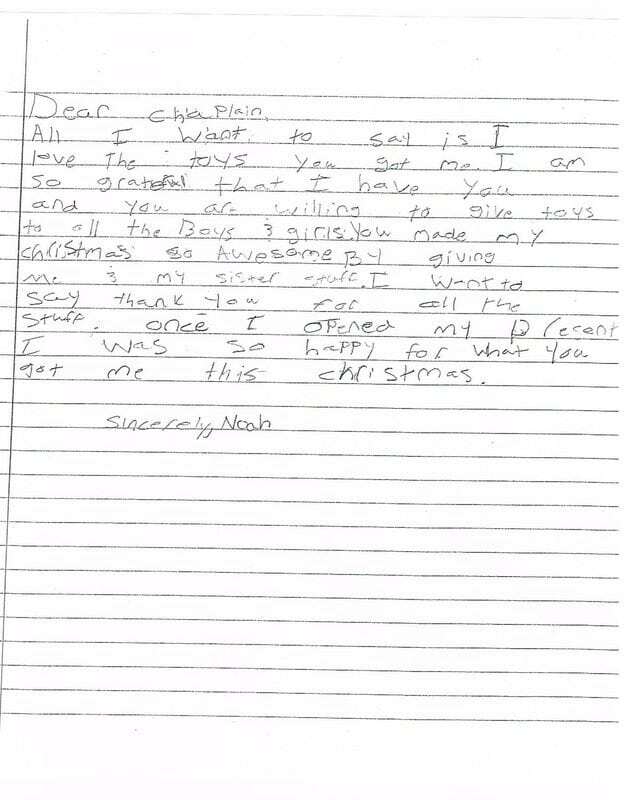 This is why we do what we do at the Homeland Heroes Foundation! I can’t say enough about the Homeland Heroes Foundation. As a military Widow with 4 children, the holidays have always been hard for us emotionally and financially. This year was exceptionally hard as I had some health issues this past year that limited my mobility and overall ability to earn money. Homeland Heroes stepped in and provided an amazing Christmas for my family. Not only did they help with Christmas but they provided my daughter with a new bed and helped my son with a crucial car repair. The generosity of this foundation is not only monetary but the grace and love that they show to each person is overwhelming and so needed! They offered a hand when needed, a hug when near and a laugh to wrap it up. I am so blessed to have been a part of this foundation and love everything about each person involved. It is a support to military families throughout Massachusetts and New Hampshire that is unrivaled. Thank you again for all that you do and will continue to do! We love you!! My husband is Active Duty U.S. Navy and is currently serving on a submarine. Earlier this year our daughter was diagnosed with brachycephaly, where the head is wider than it should be due to her inability to withstand any time on her stomach since she had severe acid reflux. Unfortunately, we discovered our insurance would not cover the Cranial Molding Helmet in order to correct this problem, even though it is 100% effective. The insurance company believed it to be not medically necessary, meanwhile my daughters condition left untreated could potentially cause further medical issues down the road. The insurance company preferred our daughter, who at the time was 8 months old, have surgery (that is only 30% effective), then they would pay for the helmet. There was no way we were going to put our daughter through surgery at such a young age, when there was another non surgical treatment. My husband and I were going to make sure our daughter received whatever she needed in order to help her, but we weren’t sure how to instantly come up with $3,000. We had to get this helmet before she turned 1 year old because after that age, the issues become harder to correct due to bones fusing completely in the skull. 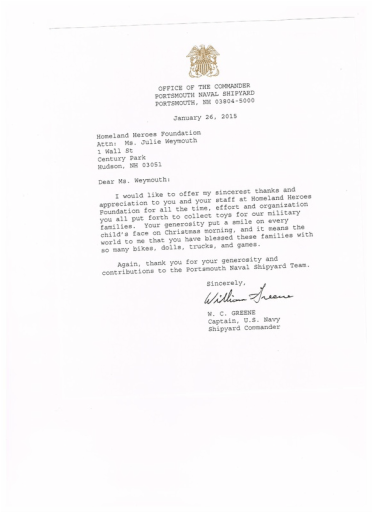 Homeland Heroes stepped in and raised the money in order for us to obtain our daughters helmet in a timely manner and we could not be more grateful. 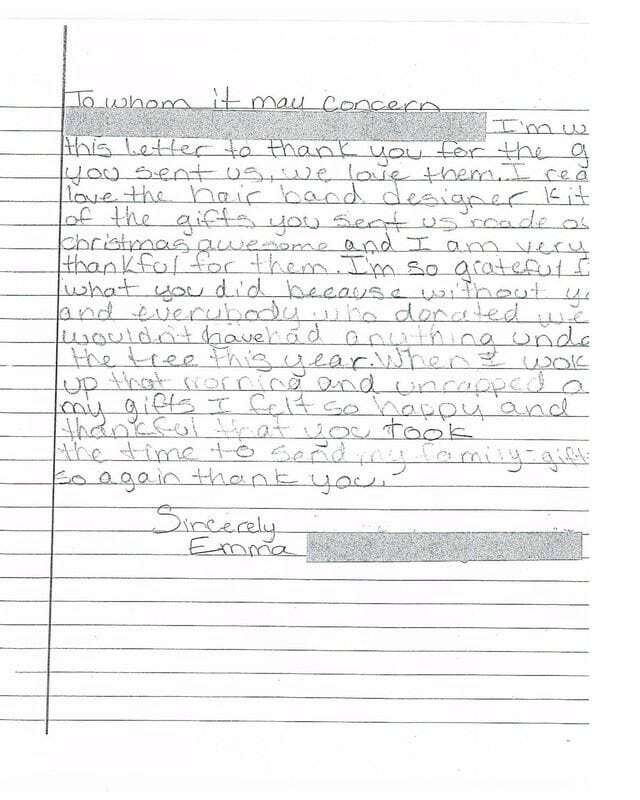 Words cannot express how thankful we are for Homeland Heroes and how they helped our daughter. It truly warmed our hearts to know there are still good people out in the world. As of today, our daughter is 15 months old and only had to wear the helmet for 2.5 months and her brachycephaly was completely corrected. She continues to thrive and grow everyday. Thank you again, Homeland Heroes! Morgan Mireles, A Sailor’s wife. I cannot put into words how thankful I am for The Homeland Heroes Foundation and Julie. My husband is an Electronics Technician on a submarine in the U.S. Navy and we are fighting Tricare in order to get our 9 month old daughter her cranial molding helmet since the insurance wouldn’t cover it because they consider it cosmetic. We never expected any help from anyone, however, I was put in touch with Julie and she took the reins and started a Go Fund Me page for my daughter and it made it possible to get my daughter the helmet that she needed in a timely manner. Without Homeland Heroes, I’m not sure what we would have done, since $3000.00 isn’t usually something you have lying around. My family and I are so very thankful for the foundation and for Julie. I just can’t express it enough. It’s amazing to know that there are still good people in the world and especially ones that support active duty military and veterans. I can not express enough how much you and your organization Homeland Heroes Foundation has helped me. I have been, and am still going through a very rough time in my life. You were there for me when i had nothing. From ordering a bed for me to referring me for different masonry jobs through your website bringing me much needed work. It is absolutely amazing how much you care about veterans and we have never even really met. I just wanted to say thank you for everything you do for our community. To the Veteran in need of help, If you need anything you WILL not feel like you are a burden if you have to reach out to Homeland Heroes Foundation. If Julie is not able to assist you she will know how to point you in the right direction. She has lent me her ear on quite a few occasions just to vent. I highly recommend reaching out if you are ever in need of anything. Homeland Heroes has been a saving grace for us. Entering the civilian life was hard enough, tack that on to never getting a foothold on our situation enough to ever buy our own furniture. Moving into an apartment with our three kids seemed daunting without any of the furniture most people take for granted. But thanks to Homeland Heroes we currently have a beautiful sectional sofa that can seat our whole family and we finally have a dining room table to call our own. Not to mention a brand new crib mattress for our baby. Thanks Homeland Heroes, we are forever grateful. As a Homeless American Military Veteran… I and those like me… are faced with a myriad of seemingly insurmountable obstacles and formidable odds. No matter what we may have accomplished in the past, or successes enjoyed by overcoming any task before us, life can sometimes take a turn for the worse. And in never seeing it coming, we are so blindsided and caught unawares that we are knocked down and unable even to arise and “Shake it Off.” The Challenges are just too great. That is, without able, genuine, adept and unfailing assistance. As a Member of the American Military Family, I can assure you that should a Comrade fall wounded, injured, or dead… we come running and will not leave our Comrade to suffer alone , nor leave him/her behind. We are not under severe obligation to do so, per se, yet it is in our essence to unquestionably do so. Even at our own peril. So it truly strikes me as an astonishment to find an Organization, of the “Civilian Species,” that conducts itself in that same Spirit. And, in its deeds, render assistance of that same veracity and caliber. In this regard, I write to commend an Organization that I am Blessed to have made company. An absolutely unpretentious and genuinely charitable group. And an Entity that is so uncommon, as to be somewhat of a Myth. And in particular, I would like to express my deepest gratitude concerning the outstanding, empathetic, splendid efforts of this particular organization’s Executive Director, Ms. Julie Weymouth. I cannot emphasize too strongly, the caring demeanor… the touching feeling of genuine empathy… and the heartwarming feeling of interacting with a Person who takes the time to learn the background and circumstance of your current situation, as is manifested in Ms. Weymouth. And quite frankly… Ms. Weymouth is “Sympatico,” a Mensch, a Sterling Human Being. An individual who retains a sense of Justice. A Person who makes a difference. Those closest to me know the struggles that I’ve been enduring for the past several months. I’ve done it a few times, but this transition from being a full-time service member to a civilian has literally been the hardest challenge of my life. Being the strong individual that I am, I’m willing to do everything possible to survive and try to pull ahead in life…but I realized that I needed a life line. That’s when I learned about The Homeland Heroes Foundation. Thank You Homeland Heroes for becoming a very near and dear part of my life… I will never forget how you saved my life. I can’t tell you how thankful I am for the support of the Homeland Heroes Foundation. Your organization does so much more than just provide furniture or appliances to our Sailors and Coastguardsmen. Yes, you meet a physical need, but what you are really providing helps to alleviate financial stress and worry over basic needs, which ultimately helps families thrive. Your organization allows our families at the Portsmouth Naval Shipyard to focus on relationships and reintegration after long deployments, which strengthens marriages, boosts morale, and increases unit cohesion and productiveness. So thank you. Thank you for helping to strengthen our families. These servicemen and women endure much during their military careers, but your service to them reminds them that they are valued, appreciated, and not forgotten. God bless you for what you do. “There’s not enough words that I could say that would show you how much love and respect I have for your foundation. You have shown us the true meaning of dignity and respect. I drove away with tears running down my face; to know that when I came home my family would have a place to put their head down, things to eat, a place to sit in the kitchen, as well as the living room, and much much more. You guys are wonderful. The most gracious thing that you can do is to show a veteran how they should be treated for their service. You see so many veterans on the street with signs that say they are homeless when their are places and people like you that can help them, I respect you more than anybody in this world”. Let me say first that the outpouring of love and appreciation from Homeland Heroes is something that I was not prepared for as I contacted Kim regarding help on items for the home. I had no clue that this was an avenue that I could tap into regarding saving of many dollars that, after buying a house would be tight. But it was not just the furniture, dishes, bureau, tables, and necessities that I received from Kim/Charlie. It was such a heart-felt glow of real appreciation and affection for my service that in fact made me so damn proud that I had. It touched me in a real personal way and I want you both to know to help veterans get a start-up isn’t all that come out of your actions. You have included me into your family of brotherhood and I’m happy to be there. I will strive to give as you have and I’m so glad to know that this exists and will do my part to pass the word. I want to Thank Julie and The Homeland Heroes Foundation for the furniture for my new home!! I am a Gulf War era disabled veteran, single mother of two and found myself jobless and homeless last summer. I was fortunate enough to find another job and was able to purchase my first home. The boys and I enjoy eating as a family at the dining room table and also watching movies on the comfortable couch that Homeland Heroes Foundation provided to us. My house really feels like a home! We finally have a permanent residence and will start making family traditions. We are all very grateful for all the blessings in our lives! My name is Craig Peterson I am a veteran of the united states I served in the United States Marine Corps from 1982 until 1986. I found myself in a position where I was in need of some household items.I was introduced to Julie and was remarkably surprised to find such a caring individual who was more than eager to help me and my daughter.I am very grateful to Julie and all the folks who are involved in this organization. Without the generous donations and the efforts of people like Julie we would have had an extremely difficult time in our present situation.I can not tell you how very pleased I am with this. I never served to expect anything in return. I want to personally thank you for all of the care packages that we received over the last week. Everyone is very appreciative and wish we all could thank you in person. I know my Troops are very happy to have the care and support from home. Thank you very much! We will be leaving next month and it cannot come soon enough. The light at the end of the tunnel is getting brighter as every moment passes. I would like to express my sincere heartfelt gratitude thanks to HomelandHeroes Foundation for their assistance in helping me to obtain Bedroom furniture, mattress, pictures, lamps, etc., etc., for my apartment. I am a USAir Force Vietnam era Veteran and the items donated to me by Homeland Heroes will make my apartment a home. A special shout-out to Cofounders Julie Weymouth and Kim McMahon for their invaluable expertise in helping me acquire the items I needed without infringing on my pride and integrity. I just wanted to say thank you to HHF for helping me out. I was a homeless veteran living in a transitional home in Nashua. I had nothing and HHF made sure I had everything I needed to get started again. They even gave me a Christmas tree and decorations. I am very grateful to them. I just want to say *Thank You* for helping my son. The bicycle you gave him so he could get to work and his appointments at the VA has been more helpful than you can imagine. I cannot say enough about the support he has received, this is a wonderful organization! Hi- this is Peter from Easter Seals Military and Veterans Services with a huge thank you to the Homeland Heroes Foundation! A few days ago I expressed the need, on behalf of a client, for a TV.This client is a pre- 9/11 veteran who is terminally ill, isolated, lives on a fixed income and only goes out on his electric scooter to go to theDoctors, grocery store, pharmacy and bank- in ALL seasons. Last year he lost his son- a Veteran of the Iraq war with PTSD, to suicide. This client spends most of his time watching sports and sports shows onTV- its his one pleasure- and he was devastated when his TV finally died less than a week ago. Thanks to a generous HHF donor, I now have a beautiful TV in my car which I will deliver tomorrow morning. My client will be thrilled. I am grateful to HHF, all generous donors, and the growing spirit that WE are the village that can truly support our Veterans in need! I once again found myself and family to be homeless with no where to go. Many of the V.A. homeless programs I did not qualify for their assistance due to my income being just over their income guidelines. This hurt me really bad, as I again found myself stranded with no resources to survive. furniture, kitchen goods – dishes, cups, glasses and silverware just to mention a few. Bedding, sheets etc.. When I was done with Homeland Heroes, I really didn’t have any further need for items to support my apartment. This amazing help enabled me to concentrate on providing food/schooling etc. for my children. As I look back on my experience with Homeland Heroes. At first, I was angry, and didn’t want any help after being turned away so many times. I would either survive or step out from life – only two alternatives for me in my dire situation. Initially, I was embarrassed to seek help from Homeland Heroes, I am now so fortunate that I did. I strongly recommend Homeland Heroes to any veteran/family struggling to make ends meet, or find themselves bordering on homelessness. This Organization stepped up to the plate to help me in my time of need, I’m confident, they will be there for you! A very Humble and Thankful Marine! keep our military families fit for the mission. “The furniture that we picked up from Chuck the other day (sofa and tables) – The tables went to a sailor who needed them and who was actually looking for some that same day 🙂 Thank you for all you are doing. You are definitely easing the burden of our military personnel. ” I wanted to send my sincerest thanks for the donation of the washer and dryer. It has made a costly time of year much easier to bear. It has been much more convenient for me to do laundry instead of taking the baby to the laundry mat. If there is any time you need volunteer work completed please do not hesitate to ask. Again, I appreciate the donation. family I have a great discomfort in paying full price for any new furniture (not to mention the toll my three daughters inflict). Thanks for taking care of us! I wish you the best of luck! 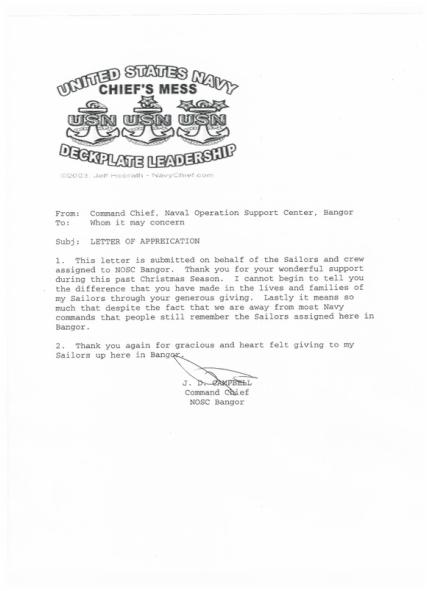 A thank you note from a sailor to HHF. My family and I would like to express our deepest gratitude to you for sending your gift of $75.00 dollars for the purchase of my required uniform item of combat boots. With this gift it allowed for us to purchase much needed medicine for my wife’s diabetes with our last bit of cash that we had left at the time. It was not easy for me to be humble enough to ask for help when we needed it however we are grateful to all those that gave of their time and money to provide for our family. As it may be our last request for awhile as the Lord has done some amazing blessings for our family but nothing will ever let us forget those who have helped us in our hour of need. May God bless each and everyone of you who gives to The Homeland Heroes Foundation because it was their sacrifice of giving that provided for this one sailor and his family; so much stress relief came from this one item that we honestly had no way to provide for. So again from the bottom of our hearts thank you so very much for your kind hearted blessings to our need. Geo-Bachelor Sailor of Portsmouth Naval Shipyard. My name is SGT Timmons I am an active duty Army soldier and last month I asked Julie for assistance with baby things, food, school clothes and supplies. I am currently 8 months pregnant and I have three daughters and times have been hard with my E-5 pay. I want to say thank you so much for the help I have received. I am currently going through some major financial issues and having another baby was not in the plans. Julie from Homeland Heroes was so supportive and seemed to truly and honestly care about me and my kids. She called regularly just to check on me, gave me legal and financial advice. I never felt so important, like everything I ever did mattered and that someone else cared and wanted to help me. My daughters are so grateful for their clothes and were able to start school off properly. Thank you for all your help; you just don’t know how much you have done for my family. I hate asking for help and you never made me feel sorry for asking, you made me feel and believe that my situation will only get better, you made me believe in myself as a mother and a woman. Things are still difficult but I feel like I have things in place a little bit better with the help from Julie at Homeland Heroes. She was able to find donors for baby items and so much more. Homeland Heroes are an awesome group of people. Please continue to do what you do because people like me are grateful for everything and anything you did for us. 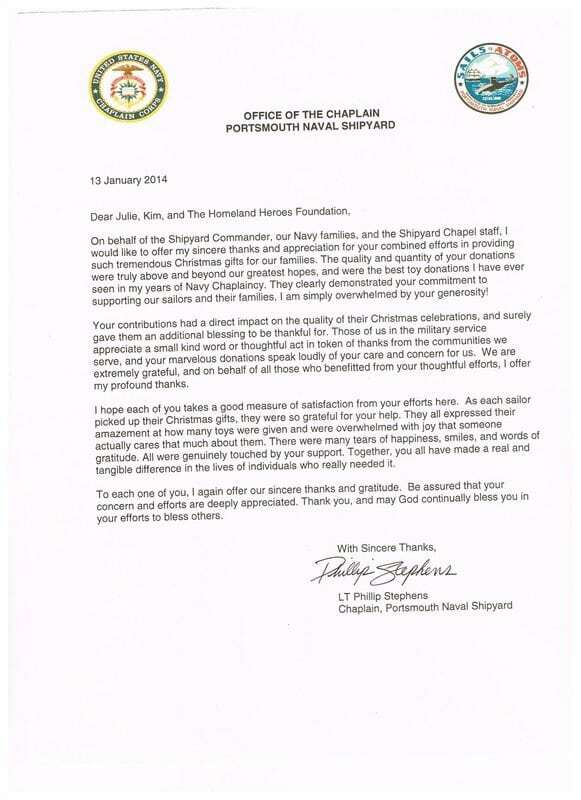 Please see the note of thanks from our Marine that will get his brand new bed delivered tomorrow. Please be sure to visit Sleepy’s if you are in the process of buying a new mattress as they have been so very generous and kind to our soldiers. I wanted to thank you and your wonderful foundation for all your hard work in accommodating me with a bed. I have never had my own bed as an adult outside of the military and I am excited for my first nights rest. In my fourteen years of Marine Corps service, I would never have thought I would be in the position of being homeless. Your quick response and follow through certainly deserves a heartfelt thanks. I wish you the best of luck in years to come, and I hope your organization continues to prosper and reach veterans all across New England.